Announcement as of 20 March 2019: Xero’s Making Tax Digital for VAT beta programme is now closed. Thank you to our network of accountants, bookkeepers and businesses that helped us test the product – we couldn’t have done it without you. The new Making Tax Digital for VAT solution is live in Xero. Read more here. There are five main steps to joining Xero’s Making Tax Digital for VAT beta programme. Follow this guide to get started. The pilot is now open to all businesses who are mandated from April. Businesses in the deferred group (mandated in October 2019) will not be able to join the pilot at this point in time. For a list of deferred businesses, please see HMRC’s guidance. As a professional tax agent firm, you need an agent services account to access new HMRC online services and use software to communicate directly with HMRC. To create an agent services account, you’ll need the Government Gateway user ID and password you currently use to access other HMRC online services for agents. You need to be the person responsible for your agent firm’s tax or administrative matters. The account gives you administrative control over your agent firm accessing new HMRC online services. You’ll get a new agent Government Gateway user ID and password when you create an agent services account. You’ll need this user ID to access new HMRC online services even if you already use a different one for other activities. To submit VAT Returns on behalf of your clients, you’ll need to link them to your new agent services account with HMRC. Invite additional clients one by one – this will link new clients and existing clients who’ve not yet signed up to use an HMRC online service. Important note: Once you’ve signed up businesses to HMRC’s MTD VAT pilot, their VAT returns must be submitted via software using MTD from then onwards. VAT submissions from businesses signed up to MTD will no longer be accepted using the ‘old’ Government Gateway or HMRC portal. Once you’ve created your agent services account and linked your clients, you’ll need to sign up eligible clients for the pilot. Your clients may qualify for the pilot if they’re a sole trader, a partnership, or currently submit the VAT Return for a limited company. Once you’ve signed up your clients to take part in the pilot, they’ll need to start using Making Tax Digital compatible software to submit their VAT Returns. If your clients pay their VAT by Direct Debit they will not be able to sign up in the 15 working days leading up to their submission date and the 5 working days immediately after it. This pilot will be opened to more businesses. Check back regularly to see if it has been extended to include more of your clients. Please note, HMRC will send you a confirmation email within 72 hours of you signing up to the service. Do not submit your client’s VAT Return until you receive the email. After you’ve signed up a business with HMRC, you need to activate the MTD for VAT solution within Xero for each business. This then allows you to review and submit MTD VAT returns. 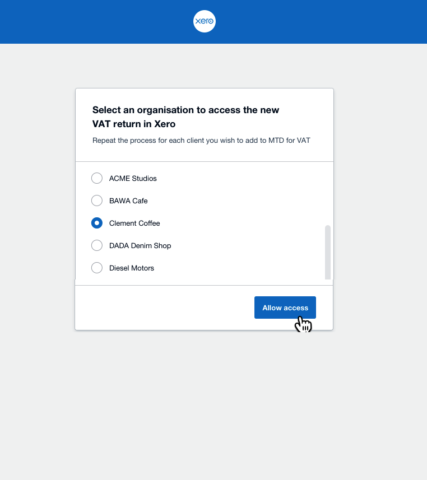 Log in to Xero via this link https://go.xero.com/vatuk/betaoptin/ to enable the MTD VAT Return solution in Xero. Follow the on-screen prompts and messages to select each business you have signed up with HMRC MTD for VAT. This will enable the MTD VAT Return solution in Xero for the business. 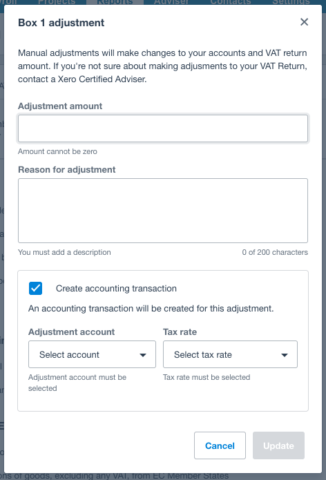 The first business (and only the first) that you submit a VAT Return for will need to grant Xero authority to connect to HMRC for MTD VAT returns. This will allow Xero to retrieve and submit VAT returns to HMRC. Once you have granted authority to Xero, HMRC will send Xero any outstanding VAT returns. It is only the outstanding VAT Returns that are listed and you will only be able to select the oldest to review or submit. 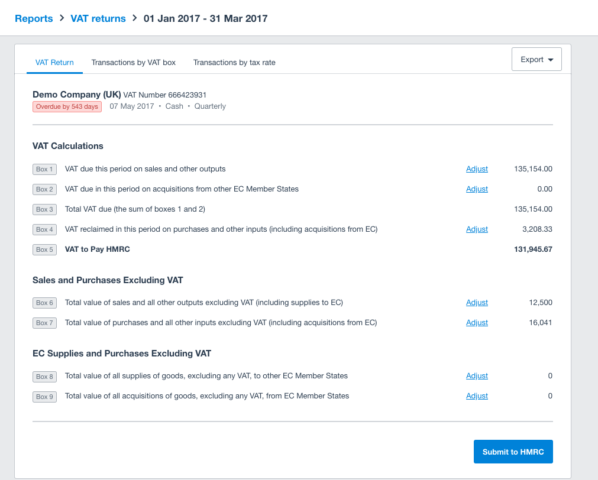 You’ll notice that you’re now able to adjust figures on your VAT Return. These are on all boxes and so are becoming a lot simpler to deal with, for example, partial exemptions, error corrections etc. With adjustments, you have the option to post a journal or not. An audit trail of any adjustments posted will appear in the reports and history on the bottom of the VAT return. The ‘old’ audit report has been renamed Transactions by Tax Rate and there is a new report called Transactions by VAT Box, which lists the transactions that make up each box on the VAT Return. This will make reviewing amounts at each VAT box much easier and faster. Help and tutorials are available for the new VAT Return in Xero Central. If you need further help, our customer experience team is here to support you. Wherever possible, please raise any support questions to us from within the Xero organisation and the MTD VAT Return page. If you need to email us, please use the words ‘MTD VAT public beta‘ in the subject line and ensure you provide details of the Xero organisation. This is a public beta for both HMRC and Xero. Whilst we do not anticipate any problems, we recommend you submit MTD VAT returns well before their due date. This way, if there are issues we’ll be able to resolve them before the due date.